I am writing this letter en route — onboard the ocean liner Orion, which is sailing to Australia. The ship is a rather large one, 42,000 tons (that’s roughly the size of the Titanic)2 and comfortable enough. This morning my travelling companion, Protopriest Constantine,3 served Liturgy in our cabin, and I took Communion. We did the same yesterday, it being the apodosis of the Feast of the Entry of the Most-holy Theotokos, since neither on the actual day of the feast, nor on the day following did we manage to serve — the ship was continually tossing. But since Thursday the ocean has grown calm, and now we are sailing peacefully. For a long time now I have been wanting to share some thoughts of mine with you — on issues concerning which we proved to be of differing views. Of course, I write not in order to initiate a sharp polemic, but rather an exchange of opinions. You pointed out that the Convent acts thus for missionary purposes, in order to give the erring ones the opportunity to pray and be sanctified by the Mysteries in a true Orthodox church. But to this I will say: that may very well be so, just as the emissaries of Holy Prince Vladimir attended the Greek Orthodox Church. However... and it’s a big “however”! The emissaries of the Prince reported to him concerning the beauty of the Orthodox Faith, and the result was that both they and the Prince himself did not remain in their error, but exchanged paganism for Christianity. And it seems clear to me that proper “missionary work” will exist in the Convent only then, when the Convent, while allowing “them” to visit the church, will, however, allow them to approach the Mysteries only upon the condition that, having received the Mysteries from us, they refuse the “Mysteries” performed at the “Rue Daru”6, and in general in the churches of the Exarchate. Otherwise what is the outcome? The outcome is that everything with them is in order, and there is no need for them to change or correct anything. And we, by admitting them to the Mysteries and not demanding any integrity or constancy in this regard, confirm them more strongly in the conviction that everything is fine with them and that their path is the true and correct path. At the Third Pan-Diaspora Sobor7 they started making speeches about how we should unite with the Parisians and with the American False-Autocephalites “in a spirit of love”. Love, you see, should unite us, and there is no need to emphasize our differences. But such talk ceased when I cited the words of one of the Holy Fathers which read thus: if we, supposedly in the name of love, so as not to trouble our neighbors, are going to keep quiet about their error and not explain to them that they are on a false path, then this is not love, but hatred! Does he do well who, upon seeing a blind man approaching a precipice, does not tell him about it, so as not to “trouble” him? Is that then love? At the latest Bishops’ Sobor,8 Vladyka Anthony of Geneva9 began to deliver a speech in that vein... He said: as regards Paris, there we have a common flock (that is, we and the Exarchate). We both alike service one and the same Orthodox people. At that point I could not contain myself and I burst forth with a speech... First of all, I pointed out that we really do have a place where we have a flock in common with other ministers of the Orthodox Church. And that is Boston. We have our parishes there, and the monastery of Archimandrite Panteleimon10 is located there too. And it has Greek practices and Typicon. All the faithful there attend both one and the other equally, since that monastery is of our jurisdiction, is absolutely Orthodox, and has our Orthodox “spirit”, despite the difference in Typicon and practices. And to which I then added: but tell me, what sort of “common flock” could I have with the Parisians, when their head, Archbishop Georgy,11 while passing by our Memorial Church in Brussels12, spits in its direction with the words — “Ugh, the Karlovci contagion!”.13 This was seen and heard by our people who were present there... But the Exarchate spits not only upon our churches but upon the Church Typicon and the canons. They perform weddings there on Saturdays, and generally whenever you like — just so long as you pay the money. They served a funeral there for an unbaptized Jew — as was reported to us with indignation by our “Zarubezhniki”.14 What kind of “common flock” could there be here and what could we have in common with them? When I was serving in Brussels for the Day of Mourning,15 a certain woman started to approach the Holy Cup. I said: ask her whether she went to confession. The answer: “no”. “Then you cannot receive Communion”. She began to make a commotion — what is this, all that is needed is a clear conscience, and so forth... But I, I didn’t get into an altercation with her, but only thought to myself: “Ugh, the Exarchate contagion”... For she was one of the “Parisians”. I am accused of excessive strictness and of “fanaticism”. But I have sufficient basis for holding to my point of view, for behind me stand great authorities, both ancient and contemporary. Let us turn to the great authorities. Here we have the hierarch Saint Gregory the Theologian, the incarnation of meekness and pure Christian love towards all, and in particular towards those who have gone astray. However, he frankly states that not every peace is to be prized, nor is every war to be feared. “There is a shameful peace, and there is a good and praiseworthy division”, says Saint Gregory.17 And the context of these words clearly indicates that he had in view those who had broken away — who had gone off into schism. Saint John Chrysostom continues: Thou (he is addressing his interlocutor) sayest, “We are all the same — they serve, pray, and teach the same as we do.” Very well —why then are they not with us? One Lord, one Faith, one baptism!25 They have broken away — in that case, one of two things must be so: either all is well with us and they are in poor straits; or else all is well with them, and we are in trouble! What do these clear and categorical words of this Holy Father signify? They indicate nothing other than that schism is graceless. Christ was not divided, and His grace is one. If one is to believe in the “state of grace” of schism, then one must either admit that we do not have grace — those who broke away having taken it with them; or else admit that there are two graces (and obviously two true Churches, for grace is given only in the true Church). Continuing to expound his thoughts, Saint John Chrysostom finally draws his conclusion — inevitable and incontrovertible: “I do say and affirm that schism is just as terrible an evil as heresy.” And heresy separates the human soul from the Church, from God, — and from salvation. What do these terrible words tell us? That the heretic leads his followers to eternal torment!... We have already seen that — not according to the present spineless reasoning, but according to the teachings of the Holy Fathers — schism is just as terrible an evil as heresy, and that obviously the end of it will be the same. I do not dare to pronounce judgment on our contemporary founder of schism, Metropolitan Evlogy; but I fear for his soul and I fear for all those who have been deceived by him and his successors and have been carried away into schism. If only people loved the truth and cherished it — would they really be content with such indifference? No, and a thousand times no! Their soul would ache, and it would not rest content until it had discovered where is the truth, which can only be one — for two truths cannot be. How correct Vladyka Nektary30 is when he always affirms: there is no such thing as “different jurisdictions”; but there is only the Orthodox Church Abroad, and outside of her are schisms and heresies. Peace and God’s blessing be with you. May the Lord and His Most-pure Mother preserve you and the Holy Convent in health and prosperity! This letter has turned out to be rather long. But having re-read it, I see that I have not said all that I consider necessary to say, and so I add this enclosure. You, Matushka, have no doubt caught the basic trend of my thoughts. I consider (I speak, of course, only for myself) that the schismatics — American and Parisian — do not have grace, for otherwise one would have to admit the absurd: the existence of several true Churches, which do not recognize each other, nor have any spiritual communion among themselves.37 This is already manifestly absurd because the Divine Founder of the Church said: “I will build My Church”,38 and not “My Churches”. I was led to this conviction both by the words of the ancient Holy Fathers (cited by me above) and by the words of Abba Anthony concerning the apparent performance of the Mysteries among those who have broken away from the true Church. To such a degree do I not believe in the grace of the schismatics’ “manipulations”, that in the event that I were dying and it was necessary to give me Communion, I would receive it neither from the “Parisians” nor from the American False-Autocephalites, lest in place of the Holy Mysteries I should swallow a piece of bread and some wine. But I have neglected still to emphasize that, the situation being such, it must be considered a most grievous thing that our “Zarubezhniki” also frequent the temples39 of the schismatics — to “confess” and “commune” there. Of what are they communing? If the Holy Mysteries, then that means that we do not have the Holy Mysteries, as Saint John Chrysostom has elucidated so clearly. But if we do have the Holy Mysteries, then they do not, and these poor people go there in vain. “Apparent” Mysteries, according to the definition of Abba Anthony — that is what the ministers of the schism offer to these credulous people. I quite understand what turmoil it would bring into the lives of those Russian people who believe in the exarchate and the false autocephaly, if that which I have written here were to be published. But will it really be better to remain silent concerning all this and take comfort in the “peace and quiet”, as Vladyka Anthony [of Geneva]40 would have us do? Why, people are on a spiritually false path! This is terrifying! And will not the awesome judgment of God fall upon our heads, if we do not enlighten our erring brothers? Some might raise an objection and say to me: Did not the Third Pan-Diaspora Sobor address both one and the other, the Parisians and the Americans, with a call for peace and unity? Yes, it did address them, but it addressed them not at all as was needed, and for that very cause this appeal produced no results, or rather, it produced a negative result. I had been certain that such would be the result. For we should have told them: you have gone astray, you have fallen away from the Church — strive to return to Her! But the appeal as published speaks to them as though they were within the Church just as we are, with equal rights and position. Whereas what should have been told them then and there was: you are not some sort of “different jurisdictions”; you are simply schismatics, and have no rights whatsoever... Come to your senses and return in repentance! Most likely such an appeal would have provoked only an outburst of rage from the leaders of the schism (God grant that I am mistaken; but then, we know their attitude). But among their “flock”, many, very many may have pondered it over and come to understand that matters do not at all stand well with them, just as the late Sandrik Filatev and many others who have broken with the schism came to understand after hearing the serious and convincing explanations of Fr. Gerasim41. The question might be posed to me: why I didn’t mention at the Sobor that I felt the appeal to be inappropriate. I would reply: because I saw the attitude at the Sobor and I feared an explosion and a possible catastrophe. For I had been forewarned that the enemies of the Church wished to arrange such an explosion, in order to “blow up” the Sobor from within. Therefore I was compelled to avoid issues which might have provoked heated exchanges. Printed in Tserkovnie Novosti (Church News), No. 58, February 1997, by Matushka Anastasia Schatiloff (née Grabbe), niece of the recipient of this letter. As is evident from the photocopies of the original, this letter was typed on both sides of five sheets of Metropolitan Philaret’s familiar letterhead bearing this stylized Cross. (Compare this with his Last Message to the Flock found in his typewriter after his repose, copies of which were distributed at his funeral. A reproduction appears in Orthodox Christian Witness, Vol. 19, No. 15, 1985, p. 2) The photocopies also show that certain personal references have been deleted by having strips of paper taped over them, apparently by whoever first put the copies into circulation, which was not Matushka Anastasia. Note that these references have only been masked, not cut out, which would have resulted in loss of text on the reverse side of these sheets. For the sake of precision these deletions have been noted below. 1 Here the second half of the salutation, apparently “Mother Magdalena”, has been masked in the photocopy. 2 Quotation marks, parentheses, all emphasis, and ellipsis marks are those of Metropolitan Philaret. All bracketed insertions and footnotes are the translator’s. 4 Here in the photocopy the name “Lesna” has apparently been masked before the word “Convent”. 5 The “Temporary Patriarchal Russian Orthodox Exarchate”, based in Paris, had been formed in 1931 when Metropolitan Evlogy (Georgievsky), having already withdrawn from the Russian Orthodox Church Abroad, placed himself and his flock under the jurisdiction of the Patriarch of Constantinople. Although the Exarchate itself was abolished in 1965 under pressure from Moscow, the present successors of Metropolitan Evlogy and his adherents remain in submission to the Ecumenical Patriarchate as its Russian Orthodox Archdiocese of Western Europe. 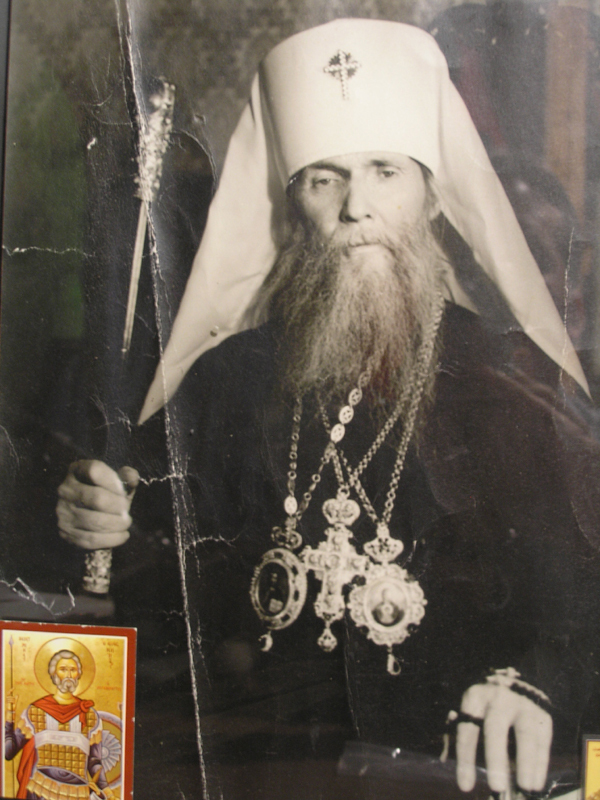 For further information in English on this and other points of recent church history touched upon by Metropolitan Philaret in this letter, see: A History of the Russian Church Abroad: 1917-1971 (Seattle: Saint Nectarios Press, 1972). 6 The street in Paris on which the Church of Saint Alexander Nevsky, the cathedral of the Evlogians, is located. 7 The Third Pan-Diaspora Sobor of the Russian Orthodox Church Abroad took place at Holy Trinity Monastery, Jordanville, N.Y. from Aug. 26/Sept. 8 to Sept. 6/19, 1974. 8 The previous Bishops’ Sobor had been held in September 1978 at Synod headquarters in New York. “Anthony of Geneva” has been masked to simply read: “Vladyka A.”. 10 Archimandrite Panteleimon (Metropoulos) of Holy Transfiguration Monastery. 12 The Church of Saint Job the Much-suffering, consecrated in 1950 as a memorial to the martyred Imperial family and to all those who had lost their lives at the hands of the Communists in Russia. 13 “The Karlovci schism” was the disparaging term used for the Russian Orthodox Church Abroad by its detractors. The name is derived from the Serbian town of Sremski Karlovci where the Synod of the ROCA first convened in 1921, and where its headquarters were located until the end of World War II. 14 Lit. : our “Diasporites” — a colloquialism for the members of the ROCA, formed from the Russian adjective zarubezhnaya (i.e., ‘abroad, in diaspora’), as in Zarubezhnaya Tserkov, the Church Abroad. 15 Apparently July 4/17, the anniversary of the execution of the Imperial family. 17 Saint Gregory the Theologian Oration 6: 20. Of course, here and elsewhere in this letter the Metropolitan is citing the Holy Fathers from memory and not giving exact renderings from their works. 19 For the full text of this and the subsequent quotations from Saint John Chrysostom, see his: Commentaries on the Epistle to the Ephesians, Homily XI. 21 Metropolitan Anthony (Khrapovitsky) of Kiev, first Chief Hierarch of the Russian Orthodox Church Abroad. 22 This conference had been arranged through the mediation of Patriarch Varnava of Serbia, with the approval of the other participants, in an attempt to reconcile these hierarchs and restore unity to the ROCA. It was convened in October 1935 in Sremski Karlovci with Patriarch Varnava presiding. The four Russian hierarchs participating were: Metropolitan Anastasy (Gribanovsky, on behalf of the ailing Metropolitan Anthony), Metropolitan Evlogy of Western Europe, Metropolitan Theophil (Pashkovsky) of America, and Bishop Dimitry of Hailar (Far East). Vladyka Dimitry also acted as secretary for the conference, with Count George Grabbe (the future Bishop Gregory) as his assistant. 23 Bishop Nestor (Anisimov) of Kamchatka. 24 Archimandrite Nathaniel (Lvov), subsequently Archbishop of Vienna. 26 From the Life of Saint Peter, Pope of Alexandria, who is commemorated on November 24. 27 Archbishop John (Maximovich) had been the ruling hierarch of the ROCA Western European Diocese from 1951 to 1962, with his residence first in Paris and then in Brussels. In 1964 Archbishop John had been one of two candidates for Metropolitan of the Church Abroad before the Sobor elected its youngest member, Bishop Philaret of Australia, to the office. Vladyka John was glorified as a saint in 1994. 28 Although it is clear what the Metropolitan intends to say here, it appears that his thoughts were flowing more swiftly than he could write, and thus he seems to have gone on to the second clause without having completed the first. The translation reflects the original and nothing of the text has been inadvertently omitted here. 29 Pope: colloquial Russian for the simple village priest. 30 Bishop Nektary (Kontsevich) of Seattle. 32 The question solemnly posed to a bishop at his consecration, to which he must reply publicly, declaring his confession of the Orthodox Faith and pledging to uphold the canons and teachings of the Church. 33 Here again in the photocopy this has been masked to read simply: “Vladyka A.”. 34 Archbishop Filothei (Narko) of Berlin. 35 At this point the bottom half of the front of this sheet of paper and three-fourths of the back side were taped over with blank white paper in order to mask the text when photocopied. The vertical strips of tape appear distinctly in the margins of the photocopy. In order to retain the Metropolitan’s signature, which stands at the bottom of the reverse side, the sheet was not cut, but merely covered over. 36 Metropolitan Philaret himself typed this title at the top of this separate sheet of paper. 37 And as Bishop Gregory (Grabbe) pointed out in an article which he wrote not long before his repose: “Our previous Bishops’ Sobors never raised the particular question concerning whether or not the New Calendarists have grace. But the fact that formerly concelebrations with them were never permitted already testifies with sufficient clarity that the Church Abroad considered them to be without grace.” See: Tserkovnie Novosti (Church News), No. 40, Sept.-Oct., 1994, pp. 2-4. 39 The word employed here by the Metropolitan is not the usual khram, which can also be used (and is so used) for a Christian church, but rather kapishche, which designates a heathen temple only. 40 And again masked in the photocopy to read: “Vladyka A.”. TO THOSE who attack the Church of Christ by teaching that Christ’s Church is divided into so-called “branches” which differ in doctrine and way of life, or that the Church does not exist visibly, but will be formed in the future when all “branches” or sects or denominations, and even religions will be united into one body; and who do not distinguish the priesthood and mysteries of the Church from those of the heretics, but say that the baptism and eucharist of heretics is effectual for salvation; therefore, to those who knowingly have communion with those aforementioned heretics or who advocate, disseminate, or defend their new heresy of Ecumenism under the pretext of brotherly love or the supposed unification of separated Christians: Anathema. For a profound and sobering commentary on the ROCA Sobor of 1983, and the Anathema against Ecumenism, written by the then Archbishop Vitaly of Montreal, see: Pravoslavnaya Rus, No. 10, 1983, pp. 3-4. For an English translation of Vladyka Vitaly’s article, see: Orthodox Christian Witness, Vol. 18, No. 1, 1984, pp. 2-6. 43 As can be seen, the Metropolitan wrote Christmas in English. His ship had docked in Sydney on Dec. 7/20.